ARTURO BENEDETTI MICHELANGELI was notorious more for cancelling his own concerts than attending them, or for driving his Ferrari cars in the Mille Miglia road race rather than working in the recording studio. Hailed as the “new Liszt” by Alfred Cortot, he was celebrated for travelling to concerts with not only his own Steinway but also his personal tuner, for his obsession with the mechanics of the piano, and for a distilled recital repertoire; the reclusive Michelangeli was, in Horovitz’s words, a “meshuga.” His aristocratic mien, foppish mane and tidy, economical manner belied his at times rather cerebral interpretations, but he could turn an audience on a whimsical phrase and march it into a cul-de-sac of breathtaking imagination. One of my greatest regrets in life is that I never saw him perform: with his delinquent disregard for a musical score, his stylistic tics, eccentric phrasing or idiosyncratic tempo, he was, if not always satisfying, a supreme and Latin celebration of individual genius. 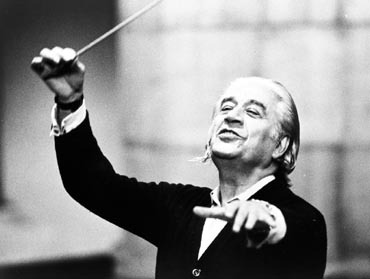 I did get to see Sergiu Celibidache, the mesmerising conductor who best of all accommodated Michelangeli’s foibles. Celibidache believed in the moment and rarely recorded, and his skill as mime artist, though considerable, never outshone the magic he weaved (see 8mins 30secs in to Ravel’s Piano Concerto where he basks in a ray of heavenly sunlight only to turn savagely on an errant cellist, or his conducting here of Enescu’s Romanian Rhapsody No.1, a work that he did not care for yet it is still effervescent and beguiling); it is rumoured that his Romanian ancestry included somehow both Merlin and Harry Potter. Along with Glen Gould, one of the most original (and certainly the coolest) classical pianist ever! This entry was posted on 18th August 2015 by admin in Arturo Benedetti Michelangeli, music, piano, Sergiu Celibidache and tagged Arturo Benedetti Michelangeli, music, piano, Sergiu Celibidache.